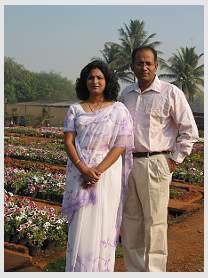 The Jagtap family in Pune, India are synonymous with plants. It was not always like this. Cira 1918: Sarjerao Jagtap came from a rural drought prone farming area near Pune. He came to the big city of Pune and educated himself. He ran many successful businesses in Pune and got financially stable. He never lost touch with his roots and continued looking after the family farms. 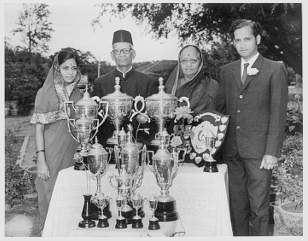 Of his eight children Ramrao was crazy about plants. The family had seen the problems and uncertainties of dryland farming. So making a full time career in agriculture was out of question. So, Ramrao Jagtap completed his Master's in inorganic chemistry and landed a cushy scientists job at the National Chemical Laboratory in Pune. His entrepreneur spirit led him to start his own factory manufacturing chromatography chemicals. But, for a man of plants, chemicals was an impossible atmosphere to work with. After long tedious hours at the factory came the joyous times of working in the garden. It was a hobby until then. Ramrao's neighbours saw the lovely roses growing in his garden and insisted he sell them some. A self generating hobby is definitely a good hobby thought Ramrao. So began the first sale of rose flowers. Living in Pune cantonment surrounded by nature loving Parsis was definitely an advantage. They encouraged Ramrao and always asked for more. In 1975 after spending 8 years of working life elsewhere came the critical decision. To make flower growing a full time occupation. Inspite of some reservations from the family Ramrao opted for the more enjoyable but much lesser paying (and uncertain) plant nursery activity. 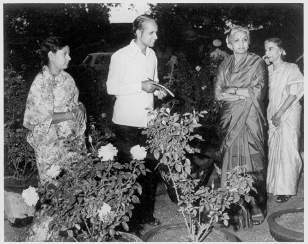 For wife Chandralekha who grew up in Gwalior and had done her BA in Sanskrit - plants were totally new. But her determination to learn carried her through. Her acute business sense made selling easy. Thus started another partnership between the two. Ramrao would produce and Chandralekha would handle the sales. There was no looking back ever since. In a short while space started becoming scarce at the Pune Cantonment residence. Hundreds of prizes were won at the local flower shows. More roses were to be planted. The family farm at Jejuri (over 50 kms away) was too far away. There was a urgent need to get a place closer to town. Ramrao's sister Meena's husband Madhavrao was very helpful. Being a successful industrialist - he helped Ramrao with space and finances when they were most necessary. Thus the farm at Loni Kalbhor was acquired in 1978. It was a low lying marshy area with nothing but grass growing. Elder son Sangram always liked plants. He grew up with so many different plant experiences. He studied horticulture, graduated in 1990 and stood first in the University. After undergoing extensive training in ornamental horticulture from Israel, Holland and USA he finally joined the family in 1993. There were a lot of new things to be done. With the co-operation of Bank of Maharashtra the planning of the Loni farm was undertaken. 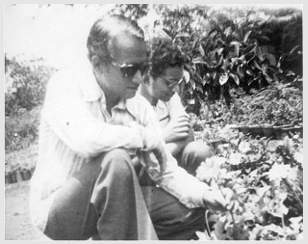 Nicknamed "Operation Paradise" it was aimed to turn the farm into a paradise for plants. The farm at loni has now spread to over eighteen acres of Nursery area. 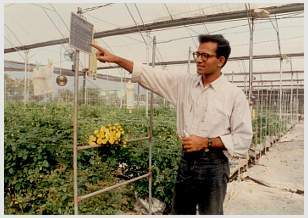 Plants are grown in dedicated areas. Besides the farm at Loni there are five other farms where plants are grown. Soon after working with plants - Sangram Jagtap realized a need for documenting plants. Many books are available - but most are from North America or Europe. These talk about their plants for their climate. An Indian database for Indian conditions was the need of the hour. Thus was conceptualized the idea of the "TUKAI EXOTICS PLANT CD-ROM". The CD-ROM was very well received. It has been widely used by nurserymen, landscapists, garden enthusiasts, students etc. The CD-ROM had its limitations - especially of space. There were many changes to be made. With an evergrowing demand for an upgrade - it was finally decided to plan for one in 2007. Work on this upgrade has been going in since January 2008. Technology has changed by leaps and bounds. It was now necessary to make maximum use of resources available. Much more information had to be presented in a convenient to use format. Indiaplants.com - the domain was registered in 1994. The idea to make the website was always there. It is now ready and yours to use. Make the most of it.